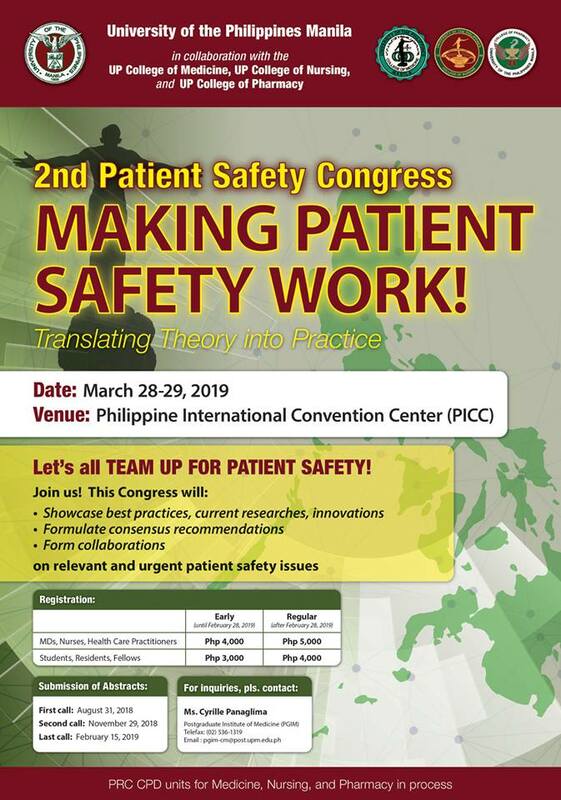 This conference follows the launch three years ago that gave an overview on Patient Safety and posed a challenge to actively start safety initiatives in healthcare institutions and across healthcare professionals and advocates. This conference now aims to present best practices, results of researches and innovation that address, key issues on patient safety, and highlight collaborations across institutions and organizations to promote a national patient safety culture. For any inquiry, please contact Ms. Cyrille Santos at 02-536-1319 / 0927-4734412 or email to patientsafetyph@gmail.com. Attachment: A document containing Last Call for Abstracts, Scientific Program, Registration Form (and Fees information). A Group of 10 (or more) people will receive a 10% discount per person.